Motor yacht Indulgence of Poole is a unique Mangusta 85’ with a fly bridge built in built in 1998. 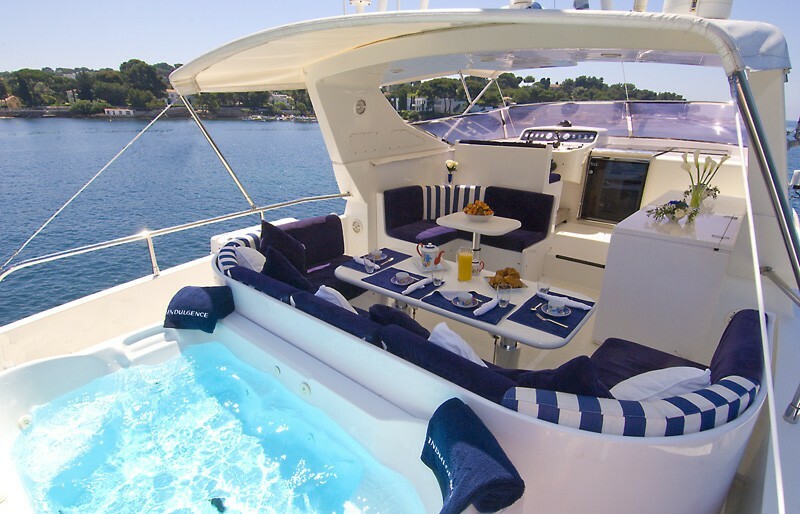 Charter yacht Indulgence of Poole offers an abundance of interior and exterior space where her guests can relax and enjoy the freedom and privacy onboard. 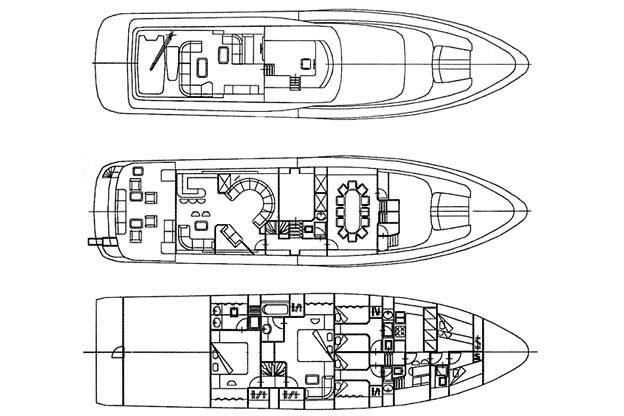 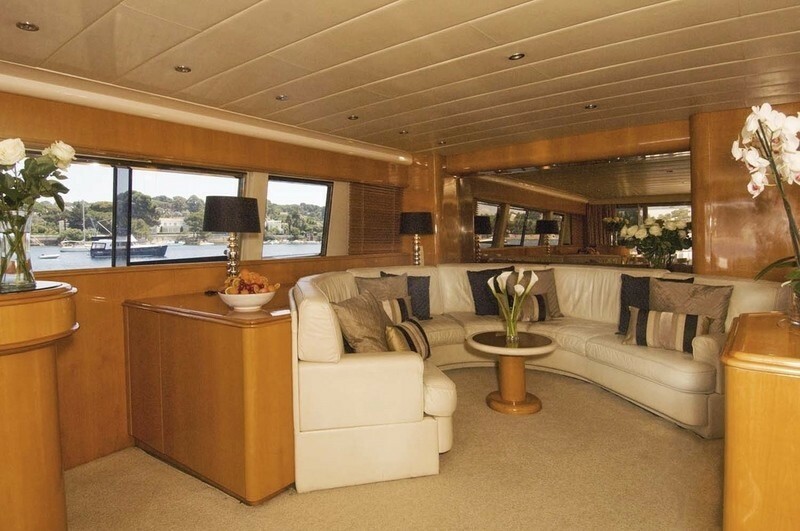 The Interior of motor yacht Indulgence of Poole is split into three levels with access from the aft deck, the fly bridge and the starboard side deck. 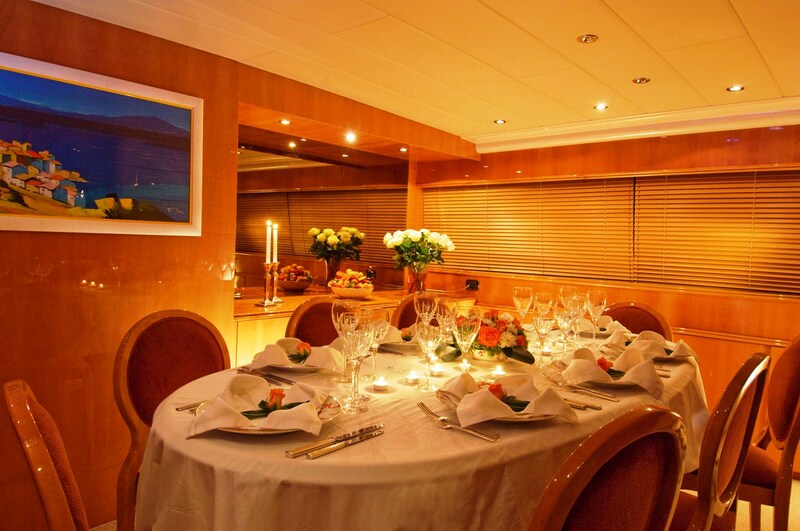 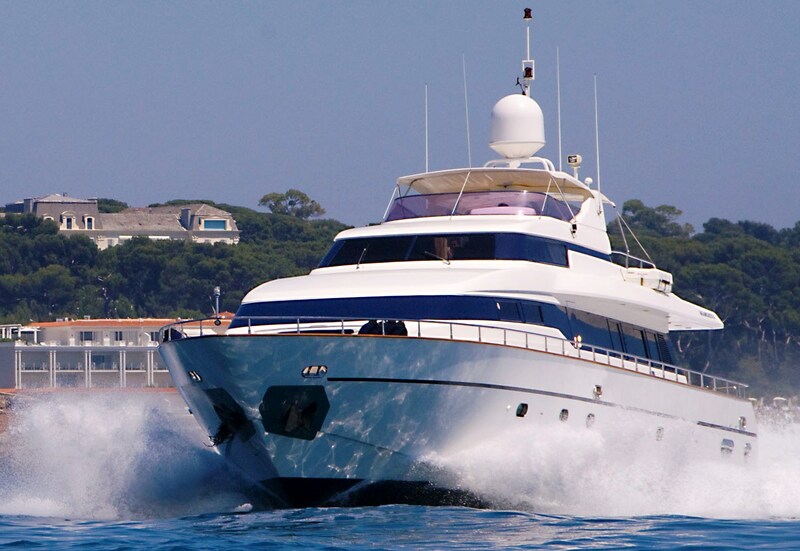 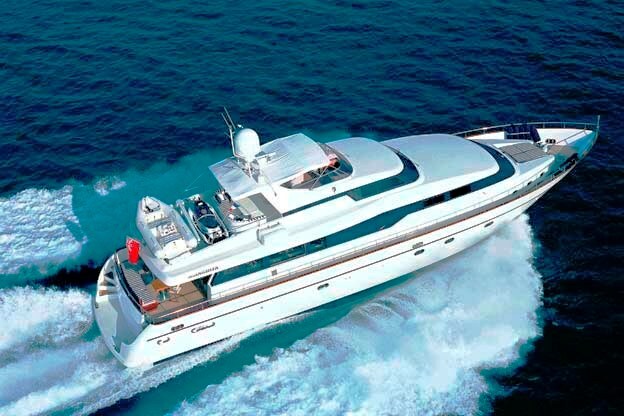 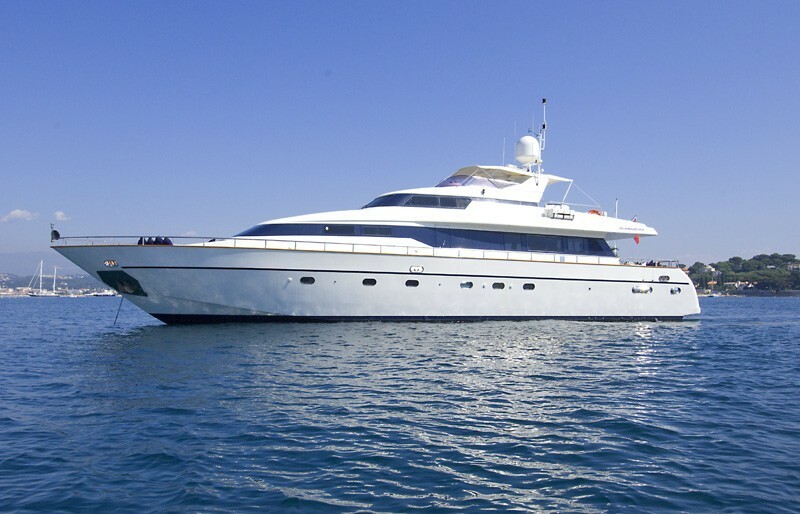 Although she is a performance motor yacht she offers very comfortable accommodation for up to ten guests and four crew, she is fully air conditioned and well appointed. 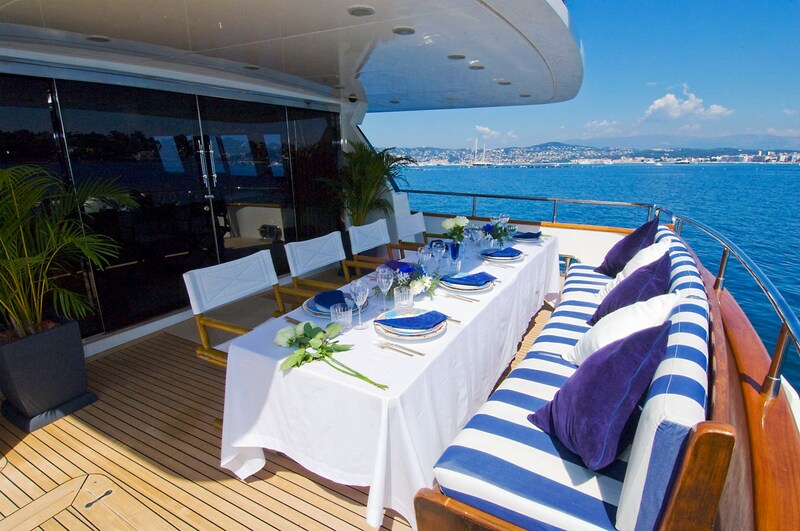 The interior décor which was refitted in 2008 endows the Mangusta 26m motor yacht Indulgence of Poole with a tasteful and luxurious atmosphere. M/Y Indulgence of Poole’s spacious saloon and the separate dining room with seating for up to 10 guests were designed with the perfect charter in mind for both corporate and family parties. 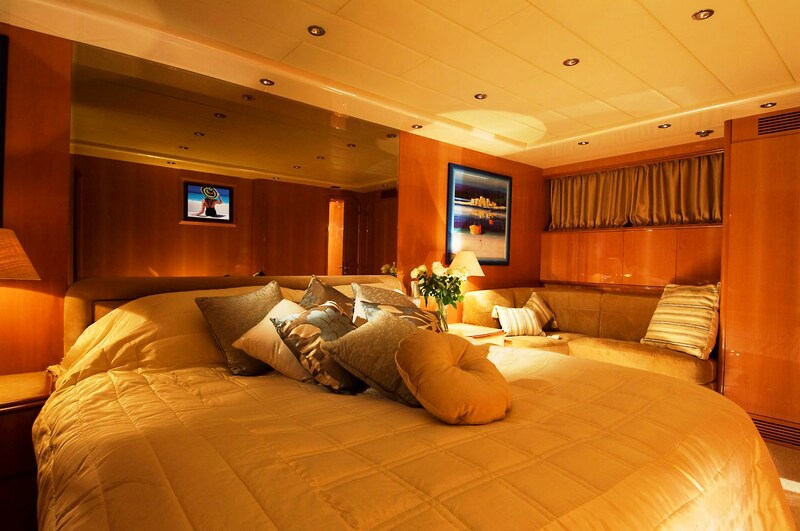 There is a full entertainments system including satellite TV. 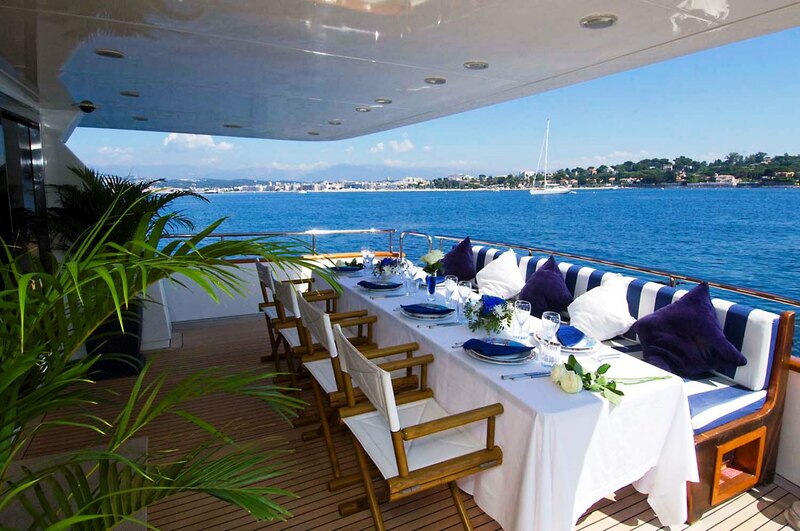 Located on this deck is a separate day head for the convenience of guests. 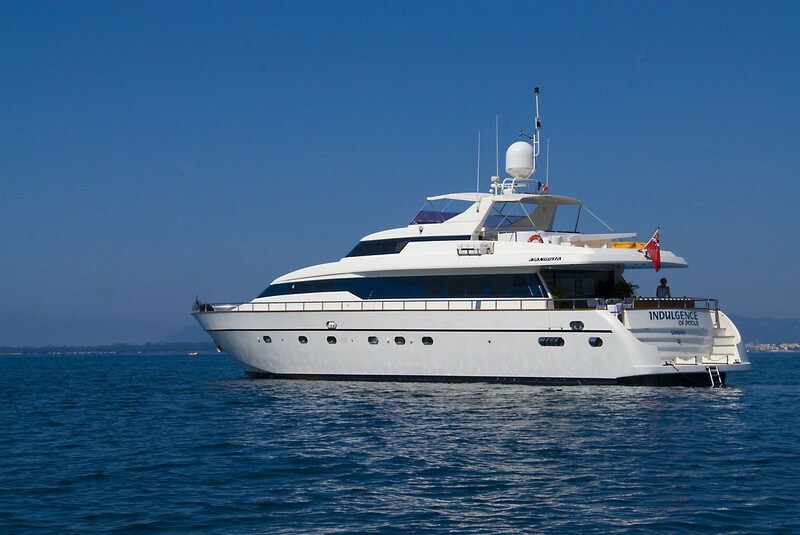 Luxury yacht Indulgence of Poole is able to accommodate up to 10 guests in 4 cabins with ensuite facilities including a Master cabin, a VIP cabin, and two twin cabins with the option of a Pullman berth in each. 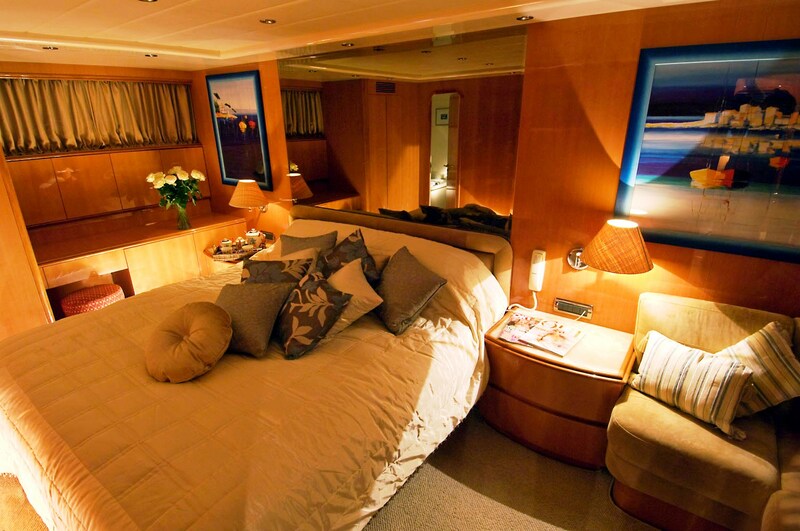 The cabins boast timeless elegance and great comfort thanks to their new mattresses, new linen and cushions. The Master cabin and the VIP are amid ships and enjoy full beam dimensions with king size beds. Both cabins are extremely spacious with plenty of hanging space. 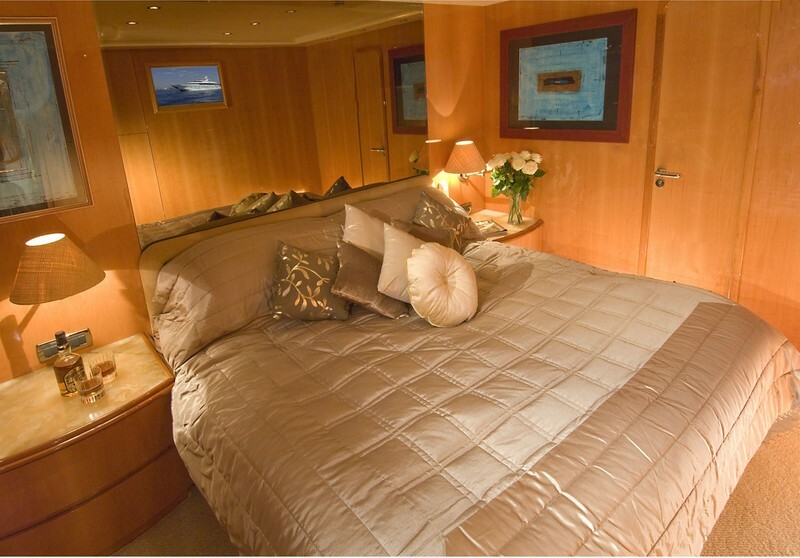 The Master cabin boasts a full bathroom facility with spa pool bath whereas the VIP has an en-suite shower facility. The two twin cabins are equally comfortable, each with their own en-suite shower and toilet facilities. 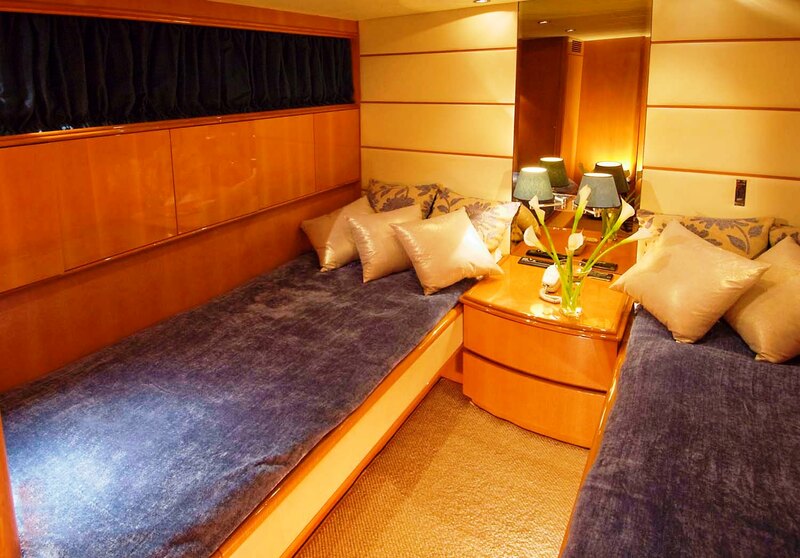 All cabins benefit from sound systems and TV/DVD facilities. Yacht Indulgence of Poole features a superb aft deck with full-size patio doors leading from the saloon which has two generous seating areas together with cocktail bar. 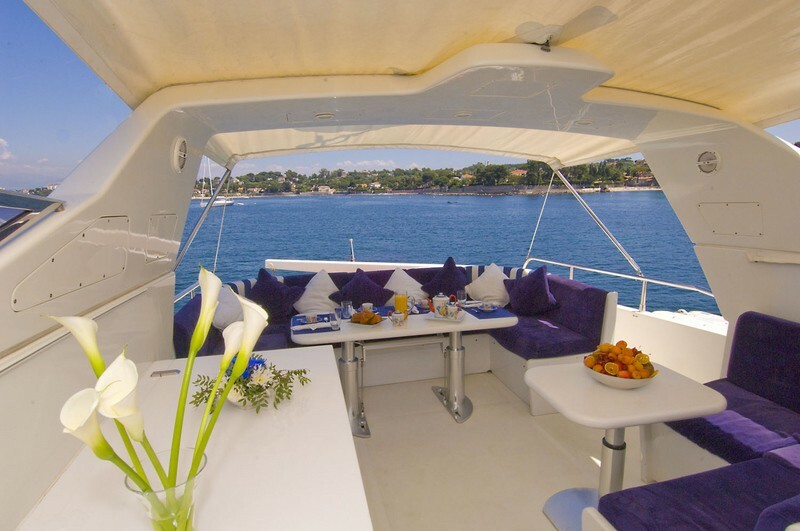 The spacious aft deck offers shade for all your meals while the fly bridge with its large bimini enable guests to enjoy al fresco diners cooked on the BBQ. 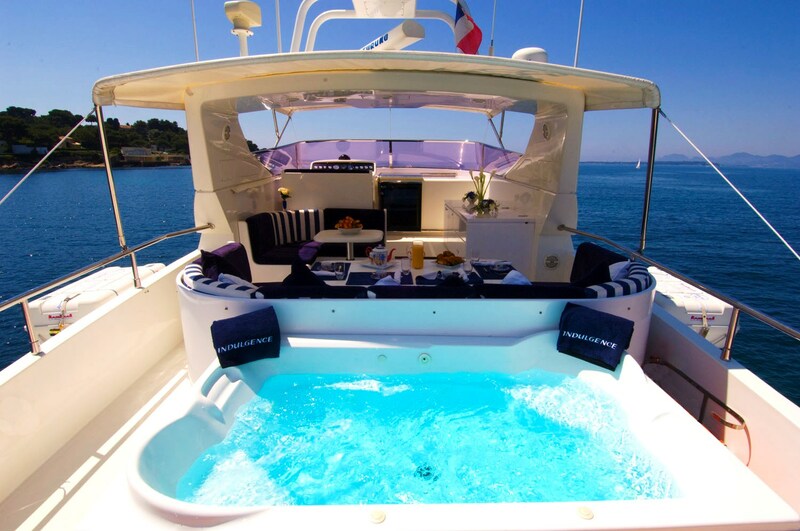 Also on the fly bridge is a large Jaccuzzi which is always a favourite spot during the day and night. 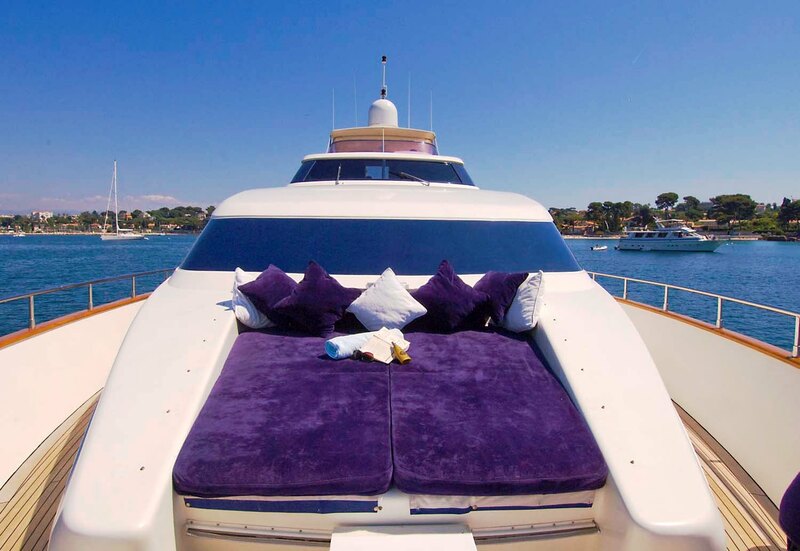 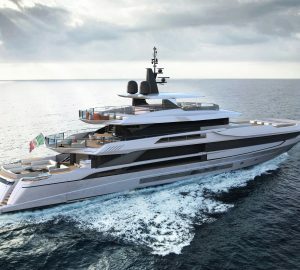 Situated at the bow is a large sunbathing area with its own sound system. 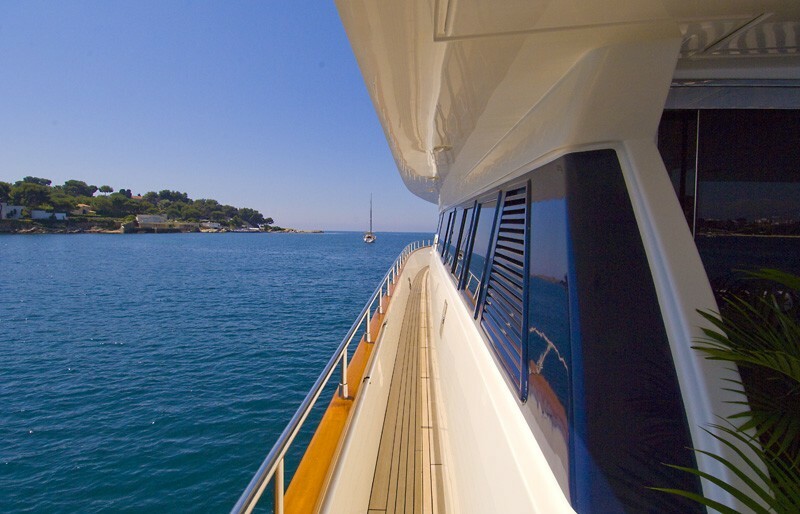 Luxury charter yacht Indulgence of Poole has a professional crew of 4 who between them speak English, German, Russian, French, Spanish and Bulgarian. The yacht also boasts a fantastic selection of water sport toys. Mangusta M/Y Indulgence of Poole is available for corporate and family charters and is able to host up to 30 guests at the quay. Luxury yacht Indulgence of Poole is able to accommodate up to 10 guests in 4 cabins with ensuite facilities including a Master cabin, a VIP cabin, and two twin cabins with the option of a Pullman berth in each. 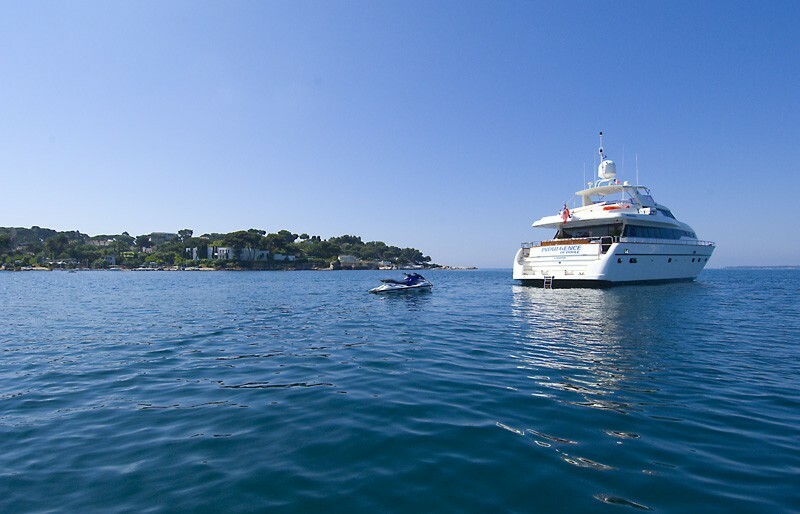 Tenders & Toys 1 x Jetski The Jetski will be onboard only for the use of the Charterers that possess a valid license at the time of the Charter.